Lion & Safari Park - The Lion and Safari Park is a 600 hectare wilderness reserve situated in the Hartebeespoort, Magaliesburg and Cradle of Humankind area. - "Click on pic to view more on this facility and an exciting tour we can offer you"
The De Wildt Cheetah and Wildlife Centre, also known as Ann van Dyk Cheetah Centre is a captive breeding facility for South African cheetahs and other animals that is situated in the foothills of the Magaliesberg mountain range in the North West Province of South Africa. - "Click on pic"
Elephant Sanctuary - The Elephant Sanctuary Hartbeespoort Dam is an elephant sanctuary providing a safe haven and “halfway house” for African elephants. It provides fully guided interactive elephant educational programs covering elephant habits, dynamics, behavior and anatomy. - "Click on pic"
Lesedi Cultural Village - Enjoy an authentic African experience on this half day tour. At Lesedi Cultural Village you will enjoy the rich African culture first hand. The people of Lesedi have created an African ambiance that you won’t find elsewhere!Visit five traditional villages including Xhosa, Zulu, Pedi, Basotho and Ndebele. Listen to the traditional music being played and the fascinating stories told by the people of Lesedi. Enjoy a local South African tribal get-together and experience some traditional dancing. - "Click on pic"
Pilanesberg National Park - Possibly the most accessible of all the fascinating game reserves in South Africa and situated in the ecologically rich transition zone between the Kalahari and the Lowveld. It promises thrilling big game viewing in a malaria free environment. A wide variety of accommodation is available to suit your needs. - "Click on pic to view one of our exciting tours to this destination"
Sun City - One of Africa’s premier vacation destinations, Sun City is internationally recognized for its superb resort offering of hotels, attractions and world-class events. From the lavish opulence of The Palace of the Lost City to the casual elegance of the Cascades, the glamour of the annual Nedbank Golf Challenge to the tropical thrills of the Valley of Waves, Sun City delivers plenty to see and do in a beautiful malaria-free landscape.- "Click on pic"
Hot Air Ballooning - Whilst sipping fine champagne you are hovering gently above the tree tops of beautiful River Valleys, or drifting majestically high above mountain ranges. 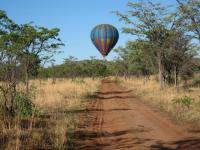 Contact us to book your balloon trip today! - "Click on Pic"